I get a lot of emails asking me for ‘ways to improve English speaking’ so I’d like to suggest 3 really quick, easy things you can do to practise speaking English, even if you don’t have any English people to practise with! When you are learning a language, it’s easy to get into the habit of thinking that you need to have lots of time to sit down and practise properly, and you think you need a notepad and a partner to practise with and a dictionary, etc, etc. Yes, all that stuff is great but if you only have a few minutes to spare, you can still practise a bit to keep the momentum going – Do you know what I mean?! So here are 3 things you can do right now IN YOUR OWN HOME, BY YOURSELF, WITHOUT A DICTIONARY OR A FRIEND! Easy peasy, hey! 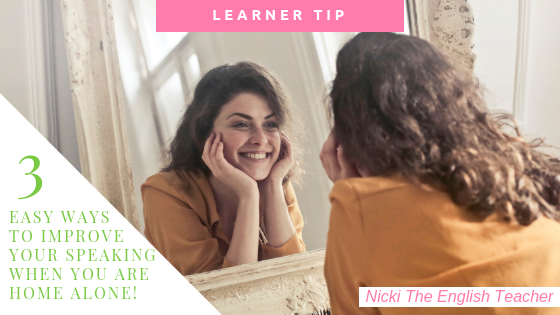 Sounds strange I know but it’s such a simple way to practise when you’re alone – Don’t do it on the bus or people might think you’ve gone crazy 😉 You can walk around your house chatting or, if you prefer, watch yourself in the mirror and imagine you are speaking to a friend. Just talk about what you are doing in that moment. Choose your favourite English song on YouTube, pop the subtitles on and sing along. Can’t think of a song? Here’s one of my favourites: A song to practise English with! Songs are a really great way to improve your English in general and your pronunciation. We’ve all got a record function on our mobile phones these days. Think of a topic (your job, your best friend, your favourite meal) and then press record and talk for 1 minute on that topic. Don’t worry about your mistakes for now, just work on your fluency. Listen to it – How is your pronunciation? Did you make lots of grammar mistakes? Could you use better vocabulary? Try again. The more often you do this, the better your speech will get. I promise! What do you think of these ways to improve English speaking? Will you try any of them? Scroll down and leave me a comment please…..I’d love to hear your thoughts! Previous Post 5 natural ways to say you are disappointed! I find these methods more realistic. I would like to try it regularly. These are good ways, I agree with you. I use second way and I like listen to music. It is good method to improve English speaking,I agree with you,Thank you.